"Louis VIII" redirects here. For other rulers, see Louis VIII (disambiguation). Louis VIII (5 September 1187 – 8 November 1226), called the Lion (French: le Lion), was King of France from 1223 to 1226, the eighth from the House of Capet. From 1216 to 1217, he also claimed to be King of England. Louis was the only surviving son of King Philip II of France by his first wife, Isabelle of Hainaut, from whom he inherited the County of Artois. While Louis VIII only briefly reigned as king of France, he was an active leader in his years as crown prince. During the First Barons' War of 1215–17 against King John of England, his military prowess earned him the epithet the Lion. After his victory at the Battle of Roche-au-Moine in 1214, he invaded southern England and was proclaimed "King of England" by rebellious barons in London on the 2 June 1216. He was never crowned, however, and renounced his claim after being excommunicated and repelled. In 1217, Louis started the conquest of Guyenne, leaving only a small region around Bordeaux to Henry III of England. Louis's short reign was marked by an intervention using royal forces into the Albigensian Crusade in southern France that decisively moved the conflict towards a conclusion. He was the first Capetian king to grant appanages to his younger sons on a large scale. He died in 1226 and was succeeded by his son Louis IX. In summer 1195, a marriage between Louis and Eleanor of Brittany, niece of Richard I of England, was suggested for an alliance between Philip II and Richard, but it failed. 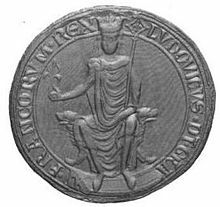 It is said that the Holy Roman Emperor Henry VI opposed the marriage, and that its failure was a sign that Richard would name his brother John as heir to the English throne instead of Eleanor's younger brother Arthur of Brittany, whom Richard had designated earlier as heir presumptive. This led to a sudden deterioration in relations between Richard and Philip. On 23 May 1200, at the age of 12, Louis was married to Blanche of Castile, daughter of King Alfonso VIII of Castile and Eleanor of England, the sister of King Richard I and King John of England. The marriage could only be concluded after prolonged negotiations between King Philip II of France and Blanche's uncle John. In 1214, King John of England began his final campaign to reclaim the Duchy of Normandy from Philip II. John was optimistic, as he had successfully built up alliances with Holy Roman Emperor Otto IV, Count Renaud of Boulogne and Count Ferdinand of Flanders. John's plan was to split Philip's forces by pushing north-east from Poitou towards Paris, while Otto, Renaud and Ferdinand, supported by the Earl of Salisbury, marched south-west from Flanders. Whereas Philip II took personal command of the northern front against the emperor and his allies, he gave his son Louis the command of the front against the Plantagenet possessions in middle France. The first part of the campaign went well for the English, with John outmanoeuvring the forces under the command of Prince Louis and retaking the county of Anjou by the end of June. John besieged the castle of Roche-au-Moine, a key stronghold, forcing Louis to give battle against John's larger army. The local Angevin nobles refused to advance with the king; left at something of a disadvantage, John retreated back to La Rochelle. Shortly afterwards, Philip won the hard-fought Battle of Bouvines in the north against Otto and John's other allies, bringing an end to John's hopes of retaking Normandy. In 1215, the English barons rebelled against the unpopular King John in the First Barons' War. The barons offered the throne to Prince Louis, who landed unopposed on the Isle of Thanet in eastern Kent, England, at the head of an army on 21 May 1216. There was little resistance when the prince entered London, and Louis was proclaimed king at Old St Paul's Cathedral with great pomp and celebration in the presence of all of London. Even though he was not crowned, many nobles, as well as King Alexander II of Scotland on behalf of his English possessions, gathered to give homage. On 14 June 1216, Louis captured Winchester and soon controlled over half of the English kingdom. But just when it seemed that England was his, King John's death in October 1216 caused many of the rebellious barons to desert Louis in favour of John's nine-year-old son, Henry III. With the Earl of Pembroke acting as regent, a call for the English "to defend our land" against the French led to a reversal of fortunes on the battlefield. After his army was beaten at the Battle of Lincoln on 20 May 1217 and his naval forces were defeated at the Battle of Sandwich on 24 August 1217, Louis was forced to make peace on English terms. In 1216 and 1217, Prince Louis also tried to conquer Dover Castle, but without success. The principal provisions of the Treaty of Lambeth were an amnesty for English rebels, a pledge from Louis not to attack England again, and 10,000 marks to be given to Louis. In return for this payment, Louis agreed he had never been the legitimate king of England. Louis VIII succeeded his father on 14 July 1223; his coronation took place on 6 August of the same year in the cathedral at Reims. As King, he continued to seek revenge on the Angevins, seizing Poitou and Saintonge from them. On 1 November 1223, he issued an ordinance that prohibited his officials from recording debts owed to Jews, thus reversing the policies set by his father Philip II Augustus. Usury (lending money with interest) was illegal for Christians to practise; according to Church law it was seen as a vice in which people profited from others' misfortune (like gambling) and was punishable by excommunication, a severe punishment. Since Jews were not Christian, they could not be excommunicated and thus fell into a legal grey area that secular rulers would sometimes exploit by allowing (or requesting) Jews to provide usury services, often for personal gain to the secular ruler and to the discontent of the Church. Louis VIII's prohibition was one attempt at resolving this legal problem, which was a constant source of friction in Church and State courts. Twenty-six barons accepted, but Theobald IV (1201–53), the powerful Count of Champagne, did not, since he had an agreement with the Jews that guaranteed him extra income through taxation. Theobald IV would become a major opposition force to Capetian dominance, and his hostility was manifest during the reign of Louis VIII. For example, during the siege of Avignon, he performed only the minimum service of 40 days and left for home amid charges of treachery. The Albigensian Crusade had begun in 1209, ostensibly against the Cathar heretics of southern France and Languedoc in particular, though it soon became a contest between lords of northern France and those of Occitania in the south. The first phase from 1209 to 1215 was quite successful for the northern forces, but this was followed by a series of local rebellions from 1215 to 1225 that undid many of these earlier gains. There followed the seizure of Avignon and Languedoc. In 1225, the council of Bourges excommunicated the Count of Toulouse, Raymond VII, and declared a renewed crusade against the southern barons. Louis happily renewed the conflict in order to enforce his royal rights. Roger Bernard the Great, Count of Foix, tried to keep the peace, but the king rejected his embassy and the counts of Foix and Toulouse took up arms against him. The king was largely successful, taking Avignon after a three-month siege, but he did not complete the conquest before his death. While returning to Paris, King Louis VIII became ill with dysentery, and died on 8 November 1226 in the Château de Montpensier, Auvergne. The Saint Denis Basilica, just to the north of Paris, houses the tomb of Louis VIII. His son, Louis IX (1226–70), succeeded him on the throne. Louis IX concluded the crusade in the south in 1229. Unnamed daughter [Blanche?] (1205 – died soon after). Philip (9 September 1209 – before July 1218), betrothed in July 1215 to Agnes of Donzy. Alphonse (b. and d. Lorrez-le-Bocage, 26 January 1213), twin of John. John (b. and d. Lorrez-le-Bocage, 26 January 1213), twin of Alphonse. Louis IX (Poissy, 25 April 1214 – 25 August 1270, Tunis), King of France as successor to his father. Robert (25 September 1216 – 9 February 1250, killed in battle, Mansoura, Egypt), Count of Artois. Philip (20 February 1218 – 1220). John (21 July 1219 – 1232), Count of Anjou and Maine; betrothed in March 1227 to Yolande of Brittany. Alphonse (Poissy, 11 November 1220 – 21 August 1271, Corneto), Count of Poitou and Auvergne, and by marriage, of Toulouse. Philip Dagobert (20 February 1222 – 1232). Isabelle (March 1224 – 23 February 1270). Stephen (end 1225 – early 1227). Charles (posthumously 21 March 1227 – 7 January 1285), Count of Anjou and Maine, by marriage Count of Provence and Forcalquier, and King of Sicily. ^ "Louis VIII, king of France". Encyclopædia Britannica. 20 July 1998. ^ Barlow, Frank. (1999) The Feudal Kingdom of England, 1042–1216. Harlow, UK: Pearson Education. ISBN 0-582-38117-7, p.335. ^ Warren, W. Lewis. (1991) King John. London: Methuen. ISBN 0-413-45520-3, p.221. ^ Warren, W. Lewis. (1991) King John. London: Methuen. ISBN 0-413-45520-3, p.222. ^ Warren, W. Lewis. (1991) King John. London: Methuen. ISBN 0-413-45520-3, p.224. ^ His existence is disputed. The chronology in Catherine Hanley's Louis: The French Prince Who Invaded England (Yale University Press, 2016), based on analysis of primary sources, shows that Louis was away from his wife from May 1216 to February 1217, and then again from April 1217 to September 1217. Therefore he is unlikely to have fathered a son born in February 1218. This Philip is not included in Hanley's list of Louis's children. Wikimedia Commons has media related to Louis VIII of France.